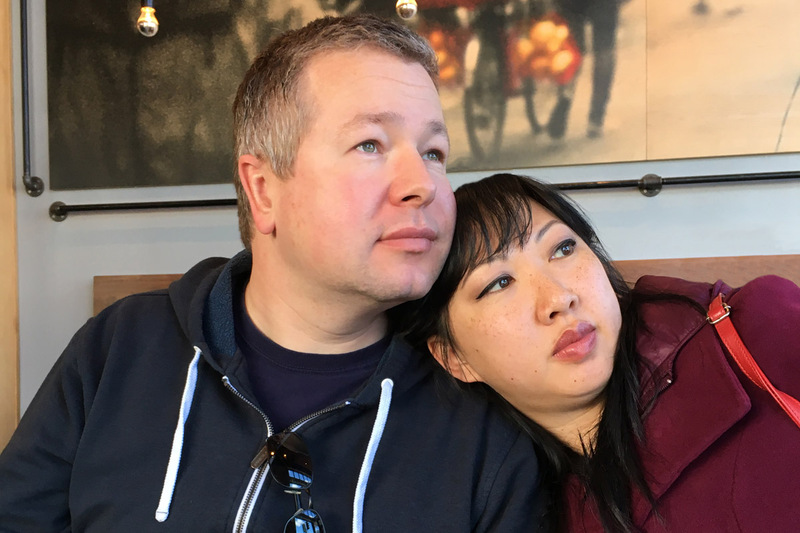 Earlier this month, Frans and I celebrated our 17th wedding anniversary! I can’t believe it has been that long already?! So how did we spend our special day? Well, after taking care of some things in the morning, we went to lunch with our daughter at a simple takeout place. We even used a few free meal coupons we were holding onto. Afterwards, we all went home and Frans and I headed straight to bed…for a long nap. We were pooped from a busy week of activity and just wanted to sleep a bit. I don’t remember what we did for dinner that night but it might have had something to do with cleaning out the refrigerator and eating leftovers. This probably wasn’t our best attempt at date night. Somehow, when you have kids, those romantic evenings seem to get further and fewer between. When our daughter was little, we had great plans to have regular date nights. We realized that, before we were parents, we were a couple. Parents should take out time to reconnect and bond in their own relationship. But, when responsibilities and the exhaustion of childrearing sets in, time alone becomes rarer. Even when my daughter is visiting family or friends, Frans and I ended up doing miscellaneous housework or errands. That’s how life goes. But what can we do about it? We would love to spend more “we time” together but how are we able to make room for it in our busy lives? Maybe, if we could shave a few minutes off mundane chores during the week, we could accrue enough free time to do a date night more often. How nice it would be to have a couple of hours every other week to ourselves for dinner and a movie, an evening stroll, a picnic, or something similar. This is what I had in mind when I heard about the new Clorox® Scentiva™ Disinfecting Wipes and Multi-Surface Cleaner. These products cut cleaning time by doing three things at once — cleaning, disinfecting, AND deodorizing. Not only do they kill 99.9% of viruses and bacteria, but they make your house smell nice too. With a small space, wall-to-wall carpet, and a dog, we need all the help we can get in keeping our place smelling fresh. 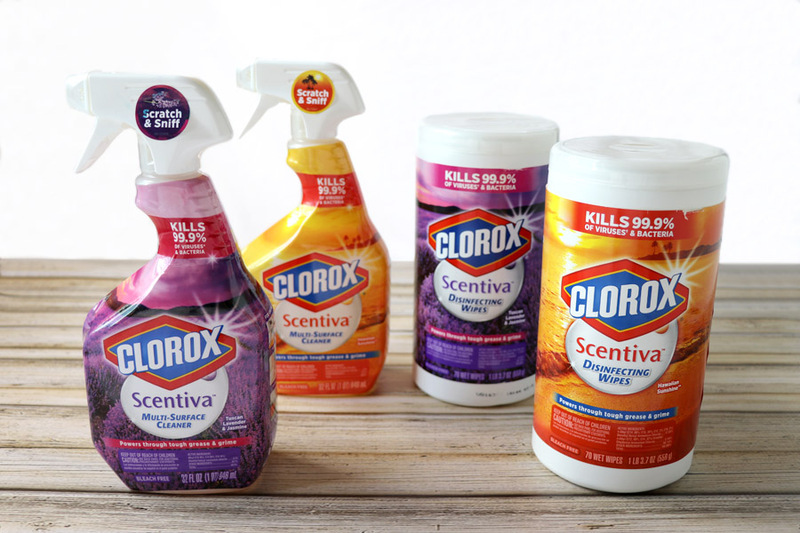 Clorox® Scentiva™ Disinfecting Wipes and Multi-Surface Cleaner come in two scents: Hawaiian Sunshine™ and Tuscan Lavender & Jasmine. Hawaiian Sunshine™ has a tropical feel with citrus and pineapple accenting the light floral scent. Tuscan Lavender & Jasmine puts you in the center of a relaxing garden setting with a hint of fruity goodness and vanilla. Both are very pleasing smells without being overpowering. Neither product contains bleach. 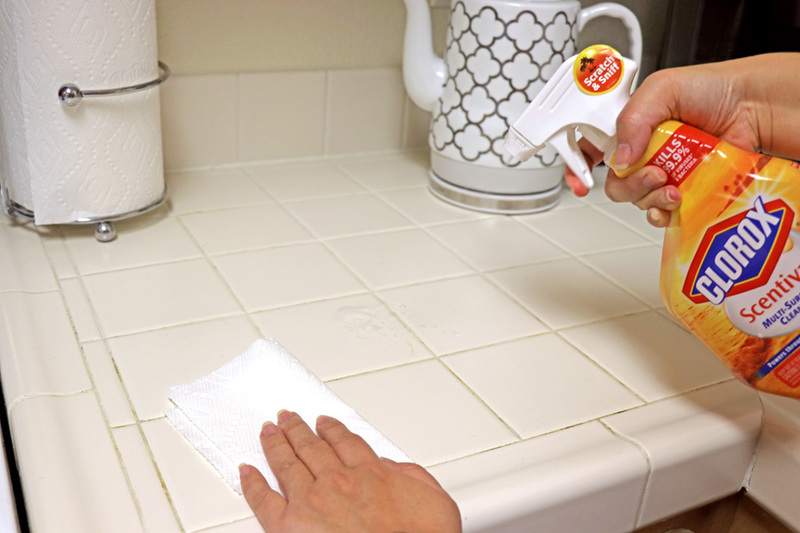 I found that using Clorox® Scentiva™ in the kitchen makes cleaning up after meals a whole lot faster. After putting food stuffs and dishes away, it only takes a few minutes to wipe down all the surfaces. I use Clorox® Scentiva™ Multi-Surface Cleaner for the stove, counter, dishwasher face, and refrigerator doors. 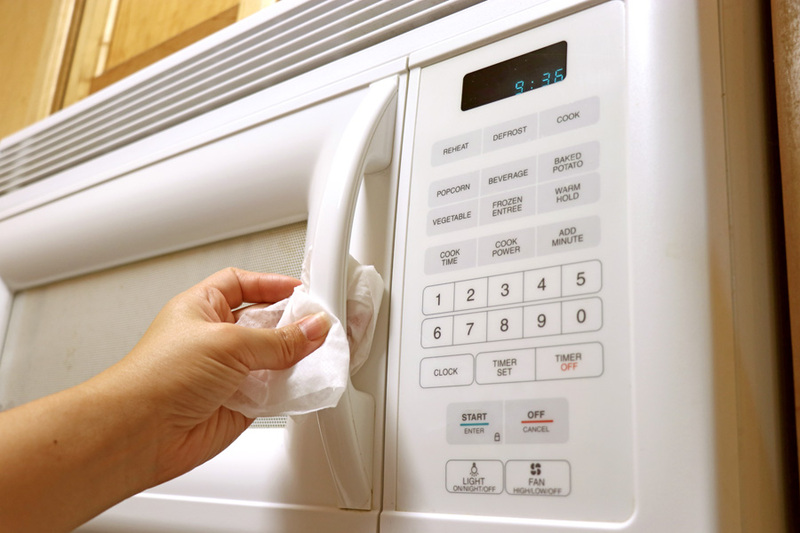 The Clorox® Scentiva™ Disinfecting Wipes are perfect for the microwave handle, appliances, and garbage. Since this product does three things in one, I end up saving five minutes after every meal. Those few minutes can really add up! What would you do with a little extra time to yourself? More afternoons at the beach. I would go to the park with my dog. I’m not even sure how to answer this. Free time, what is that? I am a mom of four kids, I work full time and I am back in school. If I ever see free time again, I would have a me day. Loud music, shopping, reading, maybe even a nap. If I had a little extra time to myself I would read a good book and drink a coffee while it is still hot! I would do crafty things with free time. If I had a little extra time, I would relax and read a mystery book! I would read more, if I had some extra time. I would indulge in Chocolate and watch more shows! I would want to read a good book but should really exercise more. If I had a little extra time I would spend it at the gym! Gym time is so relaxing and healthy! Thanks for the giveaway and post! I would curl up on the couch with a good book. I don’t get much of a chance to read anymore. I would enter more contests. I would love to drink cocktails and lay in a hammock- All day. If I had a little extra time I would take dance lessons. I would read with a cup of hot tea. I would go for a nice long walk. I’d learn a new interesting skill. Watch a movie, read a magazine! Something other than be on my phone! If I had more time I would go running more. I would like to train for a marathon. I would love to go fishing for a long weekend. I would read some of the hundreds of books on my to be read list. I would read more and take a nice hot bath and just sit and relax and do yoga! I would take the atv out more and hit the trails and just have fun. I would hit the treadmill more often and listen to a book on tape as I walk! I would read more books. I would go on a nature walk. I would take a nice hot bubble bath, and read a good book. I would read a good book. If I had extra time, I would do more reading. If I had a little extra time to myself I would go on a nature walk. I would spend my extra free time reading! I’d like to spend time with my family doing something we would all enjoy. I would like to get in some more exercise if I had more time. I would have a massage. I really need one with all of life stresses. I’d love to read a favorite book or get a pedicure. But more than likely I take a nap. If I had a little extra time to myself, I would nap. I would take some walks in the sunshine. Gotta be honest – I’d sleep! I would get a pedicure! I would go to the spa…or sleep…or read! I seem to have plenty of extra time to myself these days so I’d probably just go thrift-storing some more! I would like to say sleep but I know that wouldn’t happen. I would finish reading a book I started and maybe watch a few shows that are still in my DVR. I would use extra time to read and enjoy time with my friends. I would go for daily hikes in the mountains if I had more time to myself. I would go rollerblading, thank you so much for the great offer! I would take a nap with my husband! Actually, I would do anything with my husband, just spend that extra time together! I would read a book or nap if I had more time. I would love to cook more often, so I could eat more healthy meals. I would go to the gym and soak in the hot tub. If i had a little extra time, I would turn off my phone and go do something fun all by myself. Maybe go to a movie. If I had a little more time I would catch up on some netflix shows. Of course, I would read more. I would take my hubby on a day date! I’d take my best friend out for a leisurely lunch. I would nap or read. I would love to read a book cover to cover in one setting. I would take a nice long nature walk in the mountains around my home if I had a little extra time to myself. Right now, I am thinking that I would use the time to clean my housing….inside. It’s Spring time and the weather is changing on a daily basis; so I am using the extra cloudy days to do Spring Cleaning. (Yes, I use Clorox on a few things). Being clean is really important……especially when the weather breaks and during those great weather days you will be able to GET UP AND GO if you want; and you won’t be feeling like you should be at home cleaning then. I would go see a double feature at the movies! I’d go get a massage and then relax with a cup of tea and a good book. If I had a little extra time for myself, I would find a good book and read on my front porch. I would head to the beach! If I had extra time, I would read more. I would love to go to the beach! I would use the time to just relax. I don’t get much time anymore. I love to do cross word puzzles. I would go on a day trip to the beach! I would garden if I had extra time. If I had extra time to myself I would bake more desserts. I would take more time to craft and read. I’d read more. Thanks for the giveaway! If I had a little more time I would learn yoga. I would make it to the gym more! I would try to do something creative like write or draw. I’d read more. I have so many books I want to read. I would tackle the closets and donate some items. If I had a little extra time to myself, I’d play the hell out of my Playstation baseball game. I would read more, exercise more, do more volunteer work. I would like to craft and exercise more. I would spend some time earning badges on my pogo account. If I had had more time to myself, I would complete more craft projects. I want to eventually be able to sell them. If had a little extra time to yourself, I’d read some good books. Thanks for the giveaway! If I had a little extra time for myself I would love to read a book or watch a movie. If I had some extra time I would love to just relax and catch up on my favorite shows. Read, and possibly take a long, toddler-free bath. Oh I would love to curl up and read a book! I would bake more with my free time. I would make myself a meal and a hot bath! I would spend some time crocheting! I’d go lay in the park under the trees and relax. I would give myself a manicure that I would let actually dry and not smudge because I had to do something. I’d cuddle up with my pup and read some magazines. I would do more reading. I would read a little more. Thank you! I love to watch my favorite shows! If I had a little extra time to myself I honestly would clean! With four kiddo’s and 2 dogs, there is always a mess and I never really get a chance to deep clean any room in my house! If I had a little extra time for myself, I would nap. Working, being a mom and a grandmother and a nursing student is exhaustzing. If I had a little extra time for myself I would read or go to the gym. I like to relax on the front porch with a cup of tea. If I had a little extra time to myself, I think I’d sit and watch a movie or read a book. I would love to have a nice dinner and drinks with my husband. We haven’t treated ourselves for a while. I’d spend my extra time working in my yard. I would read more, I have a few books collecting dust that I would love to get through. Nap in the warmth of the sun in our backyard. I would read more im sure. And I would probably read more blogs. I would love to watch movies in bed. I would watch a movie all the way through without interruption. I would sit down with a cup of coffee and a good book. I would lie on the back deck and just relax in the sun all by myself. I would take a nice long nap! I would also take a nap. They’re refreshing! I would take a long walk or read a book. I would lay out by a pool! I would like to say that I’d do some sewing but I’d probably just enter contests or FB. I’d go get a massage! I like to read in my spare time! In the summer, I love to sit out on our patio and just enjoy the weather! I would drive down to see my friend who lives 200 miles away. I haven’t seen her in over 2 years. I’d love to relax with a good book. I would like to kick my feet up and relax for a few hours… read a magazine, color or call my sister. My extra time, I exercise and knit. Honestly, I would be lazy. I would read more, take naps and binge watch on tv. I would use extra free time to nap and snack and watch movies! If I had some spare time, I’d read some mystery books! I would get some needed sleep! I would get caught up on my favorite tv shows. If I had a little extra time, I would love to take a nice long hot bath or sit in a hammock with a good book. I’d catch up on all the shows I have taped on my DVR if I had some time alone. Honestly, I would probably take a nap. If I wasn’t too sleepy at the time, which I probably would be, I’d love to take a leisurely walk with my dog without the kids! If I had extra time I would use it to try and get my house more organized. Every time I’ve been in the mood to do it has been a weekend of course when I’ve been off work and I’ve got that call on the Friday of the weekend asking if my 5yr old niece would stay all night so nothing got done. Also I’ve yet to get my spring cleaning done so that would get done too. If I had a little extra time to myself I would take a moms day off and pamper myself. I would watch a good movie with a bottle of wine and a pizza. I like writing and I use to write short stories years ago when I had the luxury of free time. If I had more free time now, I would love to get back to that hobby. I would work out more. I would mostly relax but it would be nice to go out and do something. I like going out to eat and going to the movies. IF i had a little extra time i’d go out to dinner with hubby! If I had extra time, I would start playing hockey again. I would use any extra time to read or to go hiking. I love both. I would go get a manicure,facial and pedicure! I would take some time to read an then a little nap! I would go get a massage and go shopping. I’d read a clean book! I would love to work on a jigsaw puzzle if I had extra time. I would relax in the tub with a good book. If I had extra time I would definitely read a book. I love reading but never seem to find the time anymore these days. I’d have a bubble bath and read a good book! If I had extra time I would love to give myself a manicure or watch walking dead! I would go for a bike ride. Well I really don’t get much free time…a few mins here and there..check my email… enjoy a hot cup of coffeee…clean !lol! I would read more and take a few more baths! clean is that bad>> when the hubby and the kids are gone I deep clean..its nice to have a house to yourself that’s clean! I would take a nap or spend more time in my garden. I would take longer bath. I would probably enter more contests. With extra time to myself, I would take a nice long nap! I would take a nap! I feel like I’m always on the go. I would use it to sketch. And I promised a little girl a Princess so it would be a good use. I would use it to look up some Sugar free dessert soft cake recipes for my Senior Meals program. I’d use it to read some of the books I have waiting on me! I would probably finish reading my book. I would watch my favorite show without interruptions! I like to catch up on my favorite shows that I have on the dvr when I have time to myself. I would love to enjoy getting out into nature more. I’d definitely read a book! When I have alone time, I look forward to reading a few books or taking a nap. It’s always nice to have some quiet, free time. My husband and I will be celebrating 32 years together, and our 3 adult children (28,26,22) still live at home with us. Would love to have a special night with my husband. I would love to eat at a restaurant with my husband. It has been quite some time! T hanks for hte chance to win. I would read more, and maybe do some crafts. I would definitely just curl up with a good book. I would go to a day spa and get a massage and facial. If I had a little extra time to myself, I would read a book. If I had extra time to myself, I would nap. If I had a little extra time to myself, I’d start trying to teach myself Russian! I love to read and there is never enough time to read as much as I want to I would use the time to read a good book. I would soal in a hot bubble bath while listening to music and burning a candle. Instead of 10 minute showers! I would take some classes at the gym! I think I’d go get my hair cut and colored and take some time out for myself. I’d probably spend time reading a book or organizing my office. OR, I might just go get a pedicure! I would like to relax or sleep. I would love to do some running or walking with my sweet rescue dog! I would take a bubble bath. I would get housework done that I have put off. I would watch a movie! I would read—really read, like a whole book straight through. I used to do that sometimes. Now I don’t know exactly where the time goes. I need a haircut & 1st time massage soon. It is needed badly. I would take myself to the movies. I would binge on some Netflix series. With extra time for myself, I would honestly start scrapbooking all of my children’s school & artwork and awards I’ve been saving over the years. It’s been on my to-do list but I’ve never found time to actually do it! I would go thrift shopping if I had alittle extra time to myself. I’d probably eat some chocolate and deep clean my house. I would get more sleep and spend time doing activities I enjoy like working on car models and reading my kindle. Free time…??? It’s fun to think about at least! Im thinking yoga class, read a book, take a nap – in that order. I would probably take a nap or watch a movie, something relaxing. Take a long shower – with no interruptions from the kids! With a little extra I like to go kayaking. I’d tackle a sewing project. if i had more time for myself i would sleep a little bit more and read a good book. I would take a bubble bath and a nap! If I had extra time I would read more. I would pamper myself with a nice soothing bath! I think I would relax in the tub followed by reading a good book. As a single working Mama with 2 jobs, I’d take a long UN-INTERRUPTED BUBBLE BATH if I had a little free time! I would paint my fingernails. I would go get a pedicure. I would sleep in, watch bad TV- like Lifetime Movies, that I never get to watch, give myself a facial, and paint my nails! I would go to the park, sit on a bench, and read a book as I feel the warmth of the sun against my face. Or maybe I will just sleep in. If I had a little extra time, I probably would just lay down with the tv and try to relax a little. Something I never get to do. If I had a little extra time for myself I would use that time to relax or take a nap. I would love to be able to read some more! Thanks so much for the chances to win. I would like to find more time to spend with my family without t’s – telephone, television, technology. Just time together, talking. I would go the gym to workout. First a hot shower, and then a nice long nap! I wish I had more time for naps, I always feel better afterward! I will read a book and take a nap. If I had extra time I would read a good book. I would take a nice warm bath that I’ve been saying I’ll take when I have time. I think that I forgot what it was like to have a little time to myself. If I did though I would take a long hot bath without having to worry about someone knocking on the door saying they needed to use it! go see a movie on the big screen! I would just get a delicious meal, watch a movie, and then take a nap. Like many others, I would enjoy a nap. But would also enjoy spending time playing with our grandkids. I would spend the time reading a book on my tablet. I would travel more by myself! Even just a short road trip alone is my favorite way to spend my time! Read & take a nice hot bubble bath! I would take a long, hot bath and read a book! I would go to lunch with friends. I would take a long bubble bath. I would get some more of my TBR book pile read! I would have some more family time. I actually found that this summer I would have some extra time to myself. So I got a job. Alone time doesn’t exist for me lol I’m a single mom of three boys and I homeschooled but I know one day my house will be quiet and I’ll be alone and then I’ll miss the loudness. I would enter more contest like this one. To play a board game with my kids. Go hiking or boating or clean more. Never seems to be enough time to clean the house. I f I had extra time, I would read. I would take more nature photos, I haven’t had time lately. More time reading on the beach. I would read and most likely fall asleep. I would do more yoga! wish i had extra time to just sit in the chair and catch up on my netflix shows! If I had extra time I’d get caught up on some reading! Wish I had more time to each week to play basketball or tennis with my kids ! Oh wow, I would cuddle up in a pile of blankets, eat chocolate, and read a really good book. That is what I would do with a little extra time. That…. or go hiking. So …I need a lot of time so i can do both! I would read more books and watch a lot of movies! I would read a really great book! I would finally check out all of the special-interest web sites I never seem to have the time to pursue. If I had more time, I’d spend it with my son. i would probably take a long hot bath- never get to do that!! I enjoy watching tv or a movie during my free time.